Make up storage. That one thing us beauty bloggers talk about almost as often as the products. Well, where would we be without somewhere to house all our goodies? You may have seen me complaining on Twitter the other day about how pushed for space I am and how I have to either buy more storage or get rid of some of my stuff. I know what Steve would prefer and obviously that is the complete opposite to me so as you can imagine, I have been scouring the net for affordable storage options. There are two retailers that spring to mind when it comes to storage and one kept coming back over and over again: Ikea. Watch any make up storage video or read any blog post on the subject and 90% of the time the storage happens to be from Ikea and more often than not, from the Malm range. As someone trying to make their bedroom a little more girly (with much protestation from Steve! ), these are definitely on my wishlist! Typical me, falling for the hype. Pictured above (going clockwise) are the Malm 4 drawer storage in white and I also included the Malm dressing table in white. It has always been my dream to have a dressing table but as of yet, I still haven’t got my wish! It doesn’t help that our home office is in the corner of our bedroom which would mean that a dressing table is pretty much out of the question. I am planning on moving everything around in the not too distant future though, so perhaps I will get my dream! Much as I love the Malm dressing table, the fact that the Hemnes dressing table comes with a mirror is also appealing to me. I’m not quite sure which one I’d go for. Should I let my heart side with practicality or prettiness? I also had to include the pretty little stool as I wouldn’t feel right sitting at such a lovely table with my massive manly computer chair for company! Ikea have recently started a new quirky ad campaign spoofing a number of reality programmes and showcasing some gorgeous Ikea furniture. Mandy from the advert even has her own Twitter account which you can follow here. Have you seen the ad yet? I am secretly lusting after the majority of the furniture shown – I’d spend my life in Ikea if I could! Is your storage from Ikea? If not, what do you use? I know, it doesn’t look very full does it? That’s because I still haven’t picked up all of my makeup from my parents! I also had the problem that the next size down would have been too small for my collection, thus this size instead! The above storage doesn’t include my perfumes, body lotions, deodorants, shower gels and haircare products either! I’m definitely considering doing a Project 10 Pan: Bathroom edition! 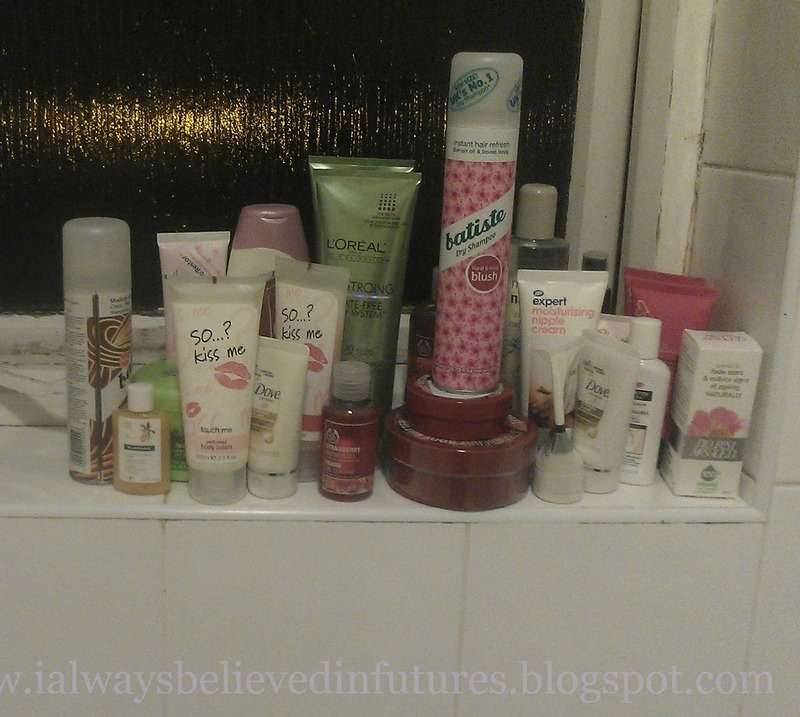 The majority above is shower gels and body lotions – do I really need that many? That’s not even all of them! What storage do you use for your beauty products? 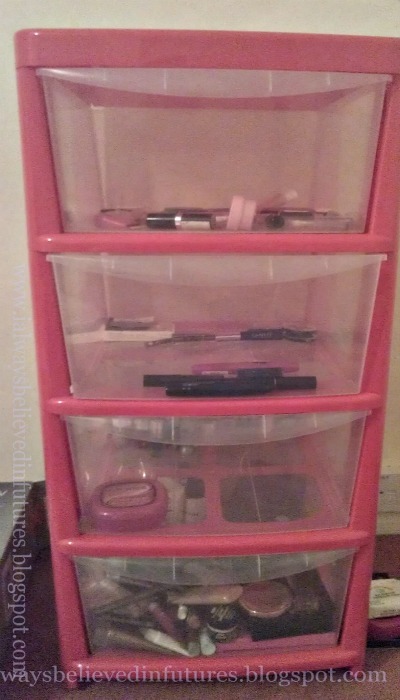 A couple of days ago on Twitter, I asked if makeup storage posts were too common, or whether people found them interesting. I only received one reply, however, the person who replied urged me to go for it – so here we are. I find that a lot of the makeup I use regularly is either in my makeup bag or rattling around the bottom of my handbag, & that in fact, the stuff that is actually stored away is either the stuff I haven’t got round to using yet, or stuff I forgot existed. Bad, I know. 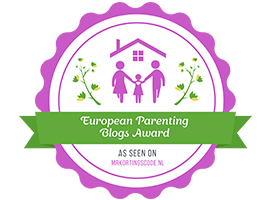 Luckily, whilst preparing this post, I found some brilliant products which I’d forgotten all about and will be using them frequently in the coming weeks. This gorgeous box holds a lot of makeup that I gained in my 21st birthday present haul. The box originally held the Kelly Brook Couture hatbox collection of bath products, however I soon shifted those off to the bathroom so I could use this for storage. ﻿I’m a sucker for a pretty box. Others store their makeup in all manners of ways – pen pots, storing their brushes in jam jars – but give me something in a pretty box, & I’m hooked. This is another gorgeous box which holds some of my makeup. This was from a FCUK bath set that my then-manager gave to me for my 21st. Again, the bath products went to their rightful place & I used the box once again for storage. Some of you may be expecting fancy ways of storing my makeup, but this is my own special way, and I haven’t got tonnes of room to store it in a fancy way. Pretty boxes do the job just as well, don’t you think? This is possibly my favourite box. Although I am not a floral fan, this just seems SO pretty, I had to use it. Excuse the mess…this is what I mean when I say I discovered these products again – no filing away eyeshadows and lipsticks and palettes into different sections for me, oh no. Once we’ve moved out (in a couple of weeks, yikes! ), then I shall have more space and be able to more organised with my storage. However, atm I like being able to find ‘treasures’ again that I forgot I had!! You may remember at the top of the post I mentioned I had found some products again & would be using them in the upcoming weeks. Would you like to see reviews of any of the products below? Let me know. Marks & Spencers ‘Perfection’ hand cream and eyeshadow and lipgloss palette. Part of my 21st present haul. Found on the clearance shelf at Boots – Rimmel & my favourite lipstick, as mentioned before. Can you remember the name from a previous post? Another Boots bargain, Botanics Aromatherapy gel. I bought this from my friends Neals Yard Remedies party in preparation for the summer & then forgot about it. Typical me. Boots No7 lipgloss and shadow palette. How gorgeous is the packaging? Boots No7 Gentle Foaming Cleanser… is this as good as Liz Earle? Not exactly makeup, & I DO use this. Lavender sleep pillow mist, part of a present from a friend. Another Neals Yard Remedies product – Power Berry Daily Moisture. Would you like to see reviews of any of the above products? & what did you think of my makeup storage?